MSSI Maryland Solar Solutions, Inc. | How Does Solar Work? Now, how do we harness the power of the sunlight that travels to our planet on a daily basis? Since 1839, people have been aware of the photovoltaic effect. The photovoltaic effect describes the creation of a voltage within a material after it is exposed to radiation, usually in the form of sunlight. This process allows electrons to flow from one material to another to create a voltage between two electrodes. 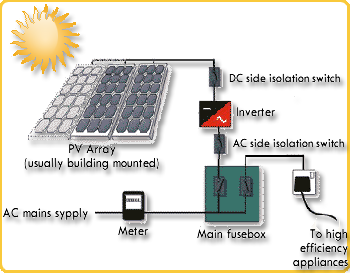 The PV material is organized into PV cells, which are then grouped together to create PV panels. 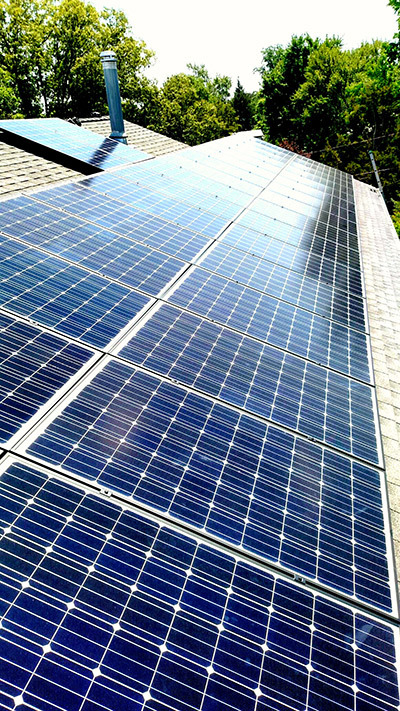 PV panels have no moving parts and will last for decades with just a simple wipe down from time to time. Right now, there is no energy source that is more dependable, easy to use, cost effective, and friendly on the environment than solar power. Not just any material will work as a PV cell, though. Most materials, when they react to the sun, create heat. Take your skin for example, you will either feel a comforting warmth, tan, or for the unfortunate, look like a lobster! Silicon, on the other hand, is a material, when exposed to the sun, will go through the photovoltaic effect. Silicon crystals are very expensive, though, and to make it more affordable for consumers, most modern PV cells use crystalline silicon or other materials. Keeping solar power affordable has been one of the major reasons that the use of solar power has doubled in one year! When the silicon reacts to the exposure to sunlight, the electrons will begin to react and a DC current will be produced. When the DC current is put through an inverter, the DC current will be converted to an AC current so that it can power people's homes and business buildings. If you are an RV owner, then you can use solar panels without an inverter, as DC currents can be used to power the electricity in RVs. Upon receiving energy through the PV cells, the converted solar energy can be used to heat water, power the central heating system, or even heat the swimming pool. In addition, through a grid-tied system, homes that generate more energy than they use can put this energy back into the grid. In some states, they may receive direct payment from the electric company. In Maryland, solar array owners are credited by the power company for excess energy produced in a given month, and this credit rolls over to months where less solar energy is generated.